In a good sized Dutch oven or other heavy bottomed pan, heat the one tablespoon of olive oil over medium-high heat until it is shimmering. Add the lamb and sprinkle with 1/2 teaspoon of salt and a good grinding of black pepper. Cook, stirring to break it apart, until it is nicely browned. Remove the lamb with a slotted spoon and drain all but 2 tablespoons of the fat. Return the pot to the stove top and add the onion and garlic (still over medium-high). Cook, stirring occasionally, until they are softened and golden, about 5 minutes. Stir in the spices (cinnamon, oregano, cumin, coriander, and red pepper) and cook until they start smelling extremely toasty and fragrant (1-2 minutes). Then, stir in the smooshed tomatoes. Cook the smooshed tomatoes in the spices, stirring occasionally, for 10 minutes. Then, add the can of diced tomatoes and 2 cups of water. Bring to a boil, then turn down to a simmer and simmer, uncovered, for 15 minutes. Add the cooked lamb back to the pot, give a good stir, then cover the pot and leave it to cook, stirring from time to time, for 20 minutes. At this point, stir in the fresh spinach and cook just a couple more minutes until the spinach is wilted. Taste and add salt and pepper to taste (keeping in mind you’ll be sprinkling just a touch of feta and olives on, which will add to the saltiness). While the lamb and tomatoes are simmering together and marrying their flavors, bring a large pot of well-salted water (it should taste like sea water, basically) to a boil. Add the orzo and cook until al dente, about 7 or 8 minutes, usually. Reserve 1/2 cup of pasta water. Drain the orzo. Toss the orzo with the 2 tablespoons of olive oil, the lemon juice, and all of the parsley, adding a bit of pasta water at a time, if you feel it needs additional liquid. Spread the orzo out on an enormous serving platter. 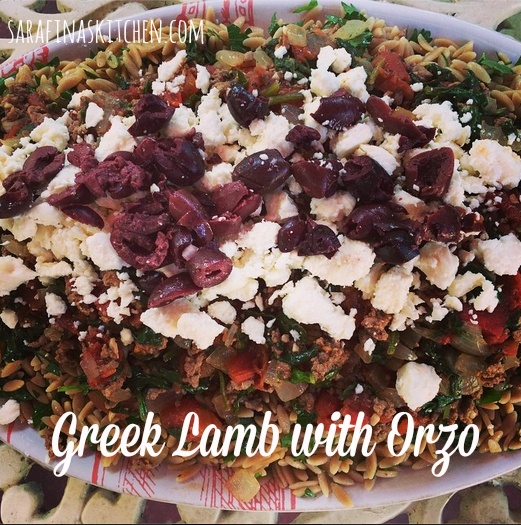 Spoon the lamb and sauce all over the top, then sprinkle with the feta and chopped olives. I love lamb! How many stars would you give this recipe? I absolutely love the combination of all of these ingredients. I have always loved lamb but my spouse does not, so I can only eat it out. I would definitely order this dish!! ive made this afew times its yummy!! I know…I need to make it again 🙂 I think it would make an impressive meal to serve for company.